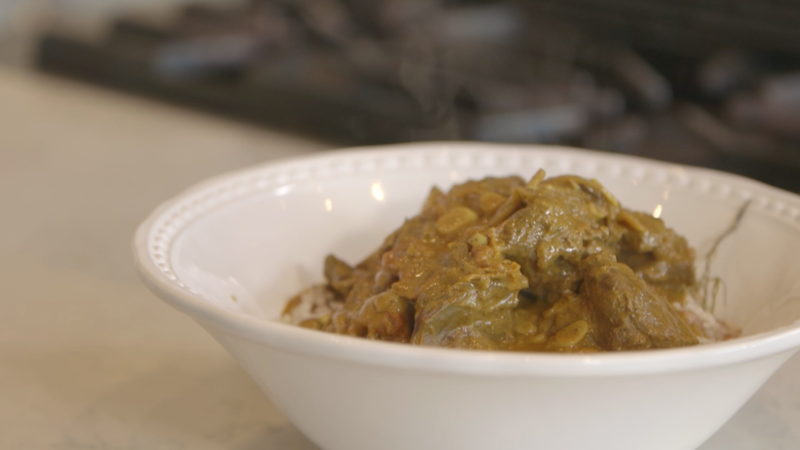 Dan takes inspiration from spending time with his grandmother in Jamaica to create this curry. This dish is truly inspired from different parts of the world. • Make spice mixture: 1 teaspoon each paprika, ground cumin, black peppercorns, turmeric, cumin seed, allspice. • Set large pot over medium-high flame and add 2 tablespoons canola oil. • Peel and finely chop one 2-inch knob of ginger. Slice 1 onion. Cut one Scotch Bonnet Pepper. Slice 4 cloves garlic. Add all ingredients to the pot, along with the spice mixture. • Season with salt and large pinch of sugar and cook over medium heat until aromatic. • Add to the pot 1 pound goat stewing meat, and cook until starting to colour, about 2 minutes. • Add to the pot 1 tin of coconut milk, 1 large chopped tomato and 1 tin of water. • Add ¼ cup rum to the pot, and bring to a boil. Once at a boil, reduce heat, and cook, covered, 2 hours. • For rice and peas: Get a pot on medium flame, add 1 large knob butter, 1 1/2 cup rice, 4 cloves crushed garlic, bundle of thyme, 1 teaspoon each of salt and sugar. Cook approximately 2 minutes until rice is coated and fragrant. • Add in 1 tin of coconut milk, fill tin with water and add to the pot as well. • Add to the pot 1 tin pigeon peas. • Bring to a boil, and then reduce to low, cover and let cook 15 minutes until cooked. • When rice is cooked, place on plate. • To finish curry, add nettles and allow to wilt for approximately 3 minutes. • Take off the heat and serve atop rice.